When I posted I Made Socks and You Can, Too! I had no idea it would garner so much attention. People from all over the world stopped by to leave comments about their projects, but also to ask questions. A lot of questions. Over the last couple of months, the comments section has turned into a full-scale conversation forum about troubleshooting everything from wide cuffs to gauge issues. Loom knitting is very different from traditional needle knitting, so of course, it has its own set of issues. However, after working with my loom on more than 20 projects, I’ve figured out a few things that makes the process much easier. Some of the common questions that have popped up on my post are listed below along with some tips and tricks. How many pegs should I use? The instructions that come with the KB Sock Loom are quite good, but they might scare those who are bit squeamish around math. For my first pair of socks, I bugged my husband and his calculator brain instead of doing it myself. Then, I realized there was an easier way to “calculate” pegs: know your shoe size and check out sock loom patterns. They will tell you how many pegs to use for various sizes. When I bought my sock loom, I bought a pattern book that turned out to be my lifeline, Sock Loom Basics (Leisure Arts #5651). Inside, there are fantastic visuals for casting on, and turning the heel, but what makes it golden is the fact that it has patterns for various sizes of socks that include specific peg counts. Ahhhh! How many pegs do I need? Don’t worry – it’s easy! My ideal peg count is 52, but I’ve also realized different yarns and patterns call for different peg counts. This isn’t an exact science! When it comes to socks you just have to get close enough. When I’m using thicker yarn like Paton’s Kroy, I know I’m going to get a bigger sock, so I can go down to 50 or 48 pegs. If I’m using a thinner yarn like Premier sock yarn, I know the stitches will be smaller, so I need to go up to 54 or 56 pegs. Another thing to keep in mind is elasticity. More elasticity means your socks will stretch more and therefore can accommodate various sizes. When using a plain flat stitch, there will be little or no elasticity, so that means a couple pegs more might come in handy. When knitting a rib pattern, there will be more elasticity, so subtracting a couple of pegs will create a more ideal fit. Ultimately, it all comes down to trial and error. My first pair of socks were knit on 48 pegs. They fit snugly and I liked them, but I realized I wanted a little more ease, so for my next pair I added four pegs, to arrive at 52. The trick is remembering it doesn’t have to be perfect. Most socks will stretch enough to fit, so erring on the side of a bit too small is best. The bottom line: Don’t be afraid to experiment and try a count that’s a little bigger or smaller than you calculated. Why is the cuff so wide? Cuffs are tricky business on a sock loom! Everything from gauge, yarn, tension, and peg count can effect the overall size and elasticity of a cuff. Despite all the variables, I have one simple answer to this question. In my experience, the K2,P2 rib pattern creates the best cuff in that it is simple and has fantastic elasticity. It works on multiple weights of yarn and compliments just about every pattern. The ideal cuff “tucks in” a bit, but don’t expect it to be tight without a little help from elastic! In my humble opinion, the K1,P1 pattern that is often called for in knitting pattern does not work on the loom. I’ve tried on multiple occasions and I always end up with a wide-mouth cuff that never shrinks down with any sort of elasticity. I rip it out every time and reknit with a k2,p2 pattern instead. That being said, for bulkier yarn (Weight 3), I’ve found a k3,p1 rib creates a nice, elastic rib. For anything thicker, upgrade to the KB Sock Loom 2 and revert to a k2,p2 rib. Another simple fix involves a trip to the craft store. In the knitting aisle, look for a spool of elastic yarn thread. For those who like a tighter cuff than average yarn can provide (no matter how stretchy the rib), this super thin elastic is knit right into the sock via the working yarn and blends in completely. How do I make the toe longer? You don’t. 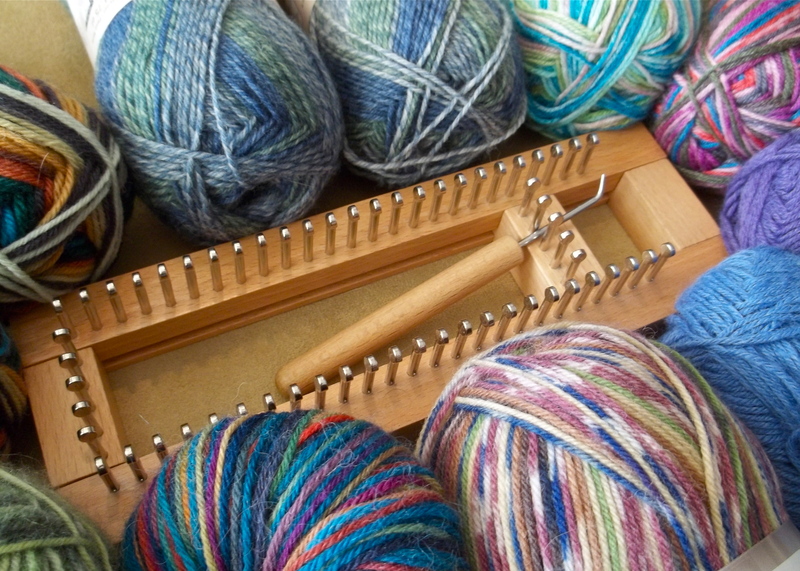 The KB sock loom uses the short row method to create both the heel and the toe. Once both circuits of wrapping stitches have been worked, the toes is complete. Adding more rows will create a bubble on the seam of the toe that can’t be fixed. Instead, think about adding length to the foot. The toe typically adds 1.5 to 2″ to the length, so always knit the foot about 2″ shorter than the desired length. I’ve gone as far as trying on the sock while it’s still on the loom. When the last row reaches the base of my big toe, I know it’s time to start working those short rows! Ultimately, loom knitting and knitting in general is a lesson in patience and experimentation. A failed project is frustrating, but it always leads to a project that succeeds. Just remember, if something doesn’t work, so what! Rip it all out and start again. That’s the beauty of knitting – mistakes disappear into a ball of yarn and nothing is wasted. Got more questions? Feel free to ask in the comments below. Next time, I’ll have some other helpful tips to help knitters get great socks while using the KB Sock Loom. Wreck This Journal: Eat Your Fruit! You make it sound so easy. And I can just hear your voice now, “It is,” along with a smile. I’m trying to believe you but haven’t mustered the courage yet. I jumped into sock loom knitting as soon as I read C.B.’s first post about it. She’s entirely right. I use the same book, and the patterns with peg numbers were a great way to get started. But the book also gives instructions for figuring out the number of pegs based on your foot measurement, and it is not too complicated. Just remember you are trying something new, and give yourself permission to experiment and mess up. I did a baby sock size sock first, just to learn the stitches and tension and how the loom worked. I didn’t care how it looked…it was just to learn with. I also agree that the K2P2 ribbing works well on the loom, especially with the Paton Kroy sock yarn. Give the sock loom a try…you too could turn into knitting maniacs like C.B. and me! You’ve got the spirit of sock knitting! Your socks are so beautiful – I hope everyone stops by your blog to see the pics! Thanks for book info! Missed that. I’m off to the KB site to take a look. Easy for you, maybe, but it’s a talent that I don’t possess, and I’m in awe of those of you who can knit these beautiful socks! Nope, you have not convinced me – you have talent!!! Hi C. B.! I don’t know if you follow Book Riot but they posted this on Facebook and I immediately thought of you. Finally! Someone has paired up some knitting patterns and audio books that are roughly the same length of time! I’m starting my first sock on a KB sock loom2. My stitches are way too tight. I’m about to rip out my first project ! What did I do wrong? I have trouble figuring out when my sock is long enough. I’ve gotten to the heel turn and everything, but since the loom is stretching the sock as it’s being knit it’s hard to tell length of the overall sock. How can I be sure I’m not making my sock too short or too long? How do you keep the yarn from springing off the loom when you use loose tension? Driving me crazy! I don’t understand the instructions for different stitches, is there a visual instruction website or YouTube that you can suggest? If the loops are so loose that they’re falling off the pegs, I’d say that’s much too loose. Loops should be snug (not too tight and not too loose) around the pegs to prevent them from slipping off. The learning videos on the official website for Authentic Knitting board are my favorite. They give very clear instructions and don’t go too fast! WOw…I am so glad I found you. I am a lefty too! Being a really frustrated person trying to learn how to knit socks on my loom…. I will try again. I think my stitches were too loose. Thanks for your inspiration! Should I flat stitch the foot or ewrap? The ankle was loose when I did ewrap, but now the foot is tight with the flat stitch. An ewrap is only used as a cast on stitch. Knitting the foot can be done in a traditional knit stitch or the flat stitch. The traditional knit stitch offers more elasticity, whereas the flat stitch does not. I tend to go with the flat stitch because it’s faster and I think it offers more stability if the sock is sized correctly. If you want more elasticity or stretch in your sock, go with the traditional knit stitch. I was wondering about this as well. Is there a particular reason to not use the ewrap on the entire sock? Would using a looser tension make it possible to use it beyond casting on? Every source I have for knitting looms has the e-wrap as a cast on stitch. It’s purpose is to create a foundation row of loops. Once the foundation row is in place, there is no need to continuously loop the yarn all the way around the peg because the stitching loop is already on the peg. If you e-wrap through the entire sock, the twist around the peg makes it impossible to produce a normal knit stitch. I imagine the stitch would become bulky because of the wrapped twist which could definitely impact tension. From experience, I’ve noticed the e-wrap creates a looser set of stitches on the cuff so I don’t imagine loosening the tension would do much good – I think you’d end up with a sock of really big and loose stitches with no elasticity. Elasticity is important in socks so you don’t want to make a wet noodle of a sock that can’t hold onto the foot! As a general rule, the flat stitch or traditional knit stitch are recommended for a basic sock in the leg and foot. 1. Could I use Red Heart Super Saver worsted weight yarn to make socks? 2. What would the result be? 3. Do you have any recommendations in doing my knitting if I use this yarn? 4. What brand of yarn do you ultimately recommend and feel makes the nicest results? Thank you kindly, and have a very blessed day. I made socks using Red Heart yarn last Christmas and they turned out pretty nice. However, I would use the regular gauge loom instead of the fine gauge loom. Sizing can be tricky because the peg count is drastically different, but I found great resource to help with that – look up Sock Loom Projects by Isela Phelps, ISBN 978-0-9856769-1-9. This booklet includes patterns for all different gauge sock looms, including regular gauge. My favorite yarn is Paton’s Kroy Sock yarn, which I use on a fine gauge sock loom. I love the range of colors it offers, plus it is incredibly sturdy. I have a sock loom 2, the sizing said 36 pegs for me. 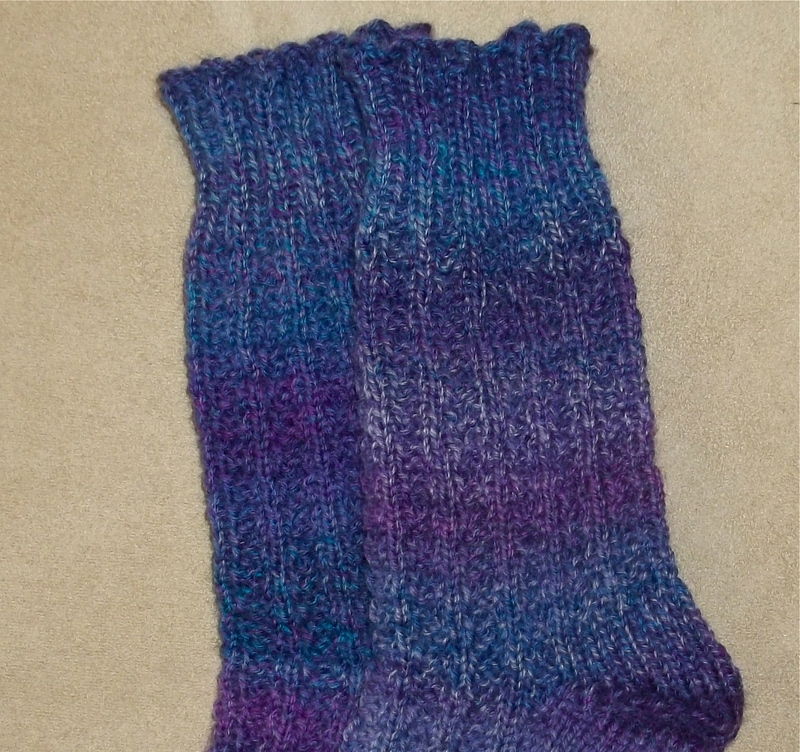 I ended up using 28 with bulky 5 yarn with elastic in it and ewrapped the whole sock, fits great. Any advice for sizing issues? Loom knitting my first sock on KB Sock Loom…..using dk yarn. FInished heel and now stuck!….cannot figure out which peg to start the foot part on. I did the extra stitch over the peg adjacent to peg #1 but when pull working yarn to peg 1, it lays over the adjacent peg……not sure if knit adjacent peg first and then peg #1…..Hope this all makes sense…..thanks for your kind response in advance. It sounds like you’re right where you should be. When you’ve wrapped the peg adjacent to the starting peg, it will lay over the adjacent peg – it looks all loose and insecure, but when you knit the first peg of the foot, it’ll be locked in place. If anything, just wrap the adjacent peg and forget about it. Knit peg 1 just like always and work your way around the foot and instep. Once you get to the last peg, knit both the stitch and the wrap and it’s all good! Just left question about starting first round for foot, and looking forward to response……but also forgot to tell you i ordered the book you mentioned…thanks for mentioning it. if knit all the way around then each peg only has one stitch on it when start the bind off. Hope this makes sense. Hi there! Congrats on finishing your first sock! 🙂 When knitting the toe, it is not necessary to knit another round after you’ve completed your short rows. Two pegs with wrapped stitches do not effect binding off – just knit both stitches and bind off as you normally would. If you knit an extra row, it’ll stick up like a little bubble on the toe seam. I am on my first sock. I am using the stockinette stitch. Everything was going well until I dropped a stitch and in my attempt to get it back on the peg lost some other stitches off other pegs. I’m not sure how to fix. I’ve seen a few tutorials on fixing dropped stitches but none where they’re all in a row and none on a sock loom. Any help is appreciated! Oh no! This has happened to me, too. I would start by putting all loops back on the pegs – it’s best to work with one stitch at a time. I’d start with the peg where the dropped stitch occurred. You’ll need a crochet hook to grab the dropped stitch (look for a straight bar of yarn where you think the stitch was dropped – it might be a couple of rounds down). Now you have a “loop” on the crochet hook. From there, you use the crochet hook to pull the next straight bar through in order to recreate the stitch. Depending on how many rows the stitch slipped, you’ll repeat this process until you’re even with the rest of the sock. Simply put the last stitch back on the peg. Once you’ve got the first peg fixed, move on to the others. It’ll take some patience, but there is a chance you can save your sock. If it doesn’t work perfectly, holes can be fixed by darning. Or there’s always the magic of starting over. The beauty of knitting is that everything unravels and nothing is really lost in terms of yarn. Is it better to knit the to or heel first? I’ve never seen a loom knitting pattern that starts with the heel or the toe, (they may exist, but I haven’t seen one). Loom sock patterns start at the cuff and work down to the toe. However, if you’re knitting with needles, there is a healthy debate among knitters whether to knit a sock from the cuff down or the toe up. All knitters have their preferences – I prefer starting with the cuff and working down to the toe. I have yet to come across a pattern where the heel is first and rightly so as I can’t see how that would work. Let me know how they turn out!! The book you now have has an excellent set of instructions for the heel. Just take it one stitch at a time!